This week has been a bit of a turning point, we have had smiles out of both boys and they are so much more alert. Those first smiles are so special, a true sign that you have an emotional connection to your baby and have really been heart warming in the middle of a tough week. They are starting to grab at things and their eyes follow us as we move around. They also seem to focus on each other a lot and when we lie them next to each other they seem to be reaching out to the other twin, I wonder how long it will be before they are grabbing and pinching! The feeds are still going well and the thicker milk seems to have stopped the worst of the reflux. They still bring milk back up now and again but as they are both still gaining weight (rapidly) I’m happy to stick to this rather than go onto something medicated. 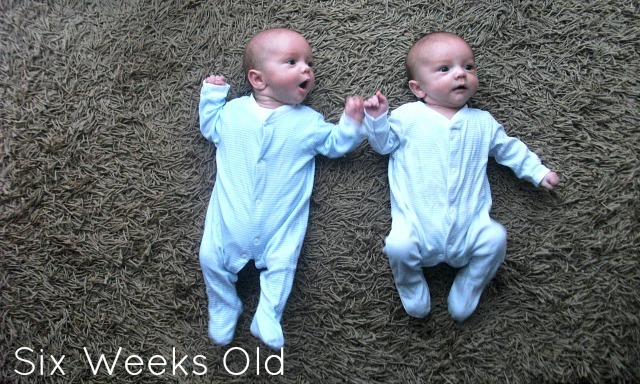 Brandon now weighs 8lbs8 and is 52cm long and Arthur is 8lbs11 and 53cm long. I wonder if they will always be so similar, I’m just so pleased how quickly they are gaining but I don’t worry too much about the centiles as the averages are based on singleton babies so surely not very useful when compared to multiples but nevermind. I can’t really complain about how easily they sleep but they do wake like clockwork, every three hours for a feed so I’ll be feeling more perky when they stretch that out. Still, the fact that they go down in the night a sleep until the next feed means we get a couple of precious hours sleep which can make all the difference. This week I’ve been feeling a bit like I’m just on a treadmill of changing and feeding, there never seems to be time to fit anything else in! Inbetween feeds I’ll wash and sterilise bottles then feed or play with Lucas and before I know it we are back to a feed again; it has been exhausting and it is starting to hit both of us. There is no let up for either one of us as we both do the night feeds and we have both felt under the weather this week. I remember 8 weeks being a bit of a turning point for Lucas thought so I think we’ve done ok getting this far without major tiredness setting in! This has probably been the hardest week so far but even then I wouldn’t change a thing, it still feels so, so special to have two babies!